The Banking, Financial Services and Insurance (BFSI) sector is one of the highly growth oriented industries as numerous developed as well as developing countries are now making huge strides turning into digital economies. This presents massive opportunities for products, solutions and services providers to create new avenues of business for themselves. 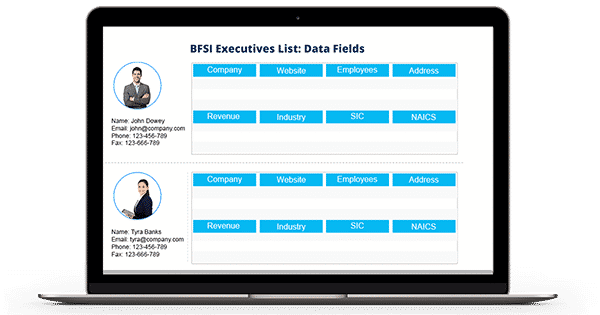 With an objective to help marketers with competent data to carve out their special place in the heavily crowded BFSI market, Blue Mail Media provides BFSI Executives Email List which could help marketers like you to achieve greater success on your marketing campaigns. Our Banking and Finance Executive Email and Mailing List is a compilation of complete marketing information to reach your prospects via telephone, email or mail. Many times, it becomes difficult for marketers to make a direct connection with top level BFSI decision makers since they need to pass through many junior level executives to get their message across. With Blue Mail Media’s Banking and Finance Email List, the unnecessary barriers in communication can be avoided and right prospects can be reached. Also, as each business organization has unique marketing requirements, we offer pre-packaged as well as customized Banking Executives Email List based on your specific preferences. Blue Mail Media has a strong presence across USA, UK, Canada, Europe, Asia, North America, Australia and other major parts of the world, which enables us to serve you in a global yet local way. We also house a strong team of data scientists, analysts and experts who dig out the most authentic and reliable data from various sources and enhance its quality on a constant basis so that you achieve greater response rates, conversion rates, and eventually greater ROI.